Golden Swank: J'ADORE FALL OR J'ADORE HALLOWEEN? J'ADORE FALL OR J'ADORE HALLOWEEN? How weird is it that I haven't dressed up for the past three years on Halloween? I love to decorate my house for fall and do all the fall things, but when it comes to Halloween, I don't do much for it! Maybe once I have kids, that'll change. I've been seeing a ton of pics online of my friends who dress their kids up in the most decked out costumes and I'm just like how?! They're always the absolute cutest things but I just don't think I have it in me! I'm probably going to be that mom driving their kid to Party City on October 30th to pick one of the two sad costume choices left. Andddd I'm also probably going to be that parent everyone rolls their eyes at for handing out oranges with Jack-o-lantern faces on them. I'm sorry but enjoy this adorable + healthy option. Your teeth will thank me later. Are you way into Halloween or are you more of a fall gal like me? 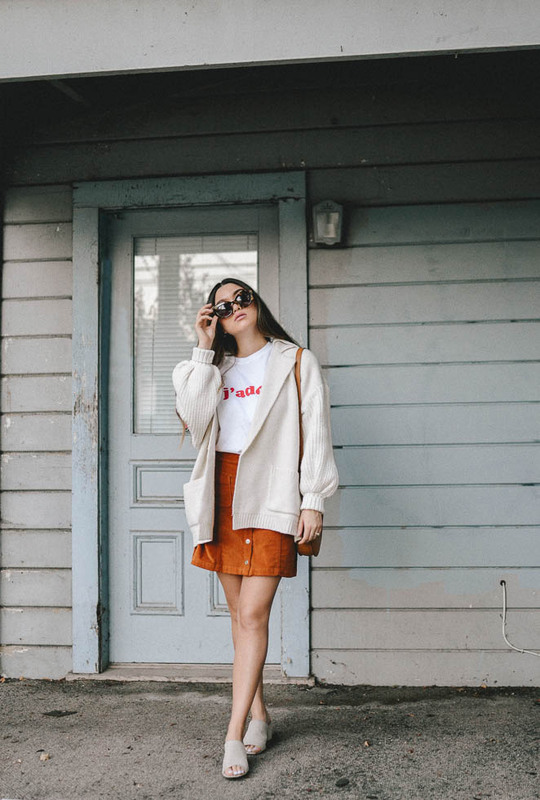 Here's a little outfit inspo for that brisk fall day. This cardigan is truly the most amazing thing I've gotten in a long time. It's basically a chic blanket with the most amazing balloon sleeves. My love for it knows no bounds. If you're thinking of ordering it, make sure to size down because it's definitely oversized (in all the good ways). I paired it with this cool 'j'adore' tee and suede skirt to pump up the fall vibes. Hope you like it! P.S. I know alllll you little gremlins are going to be posting your Halloween costumes/pumpkin carving pics today! I thought I'd help my fellow friends out and share a list of my top five Halloween puns to use for your captions... because I'm the cheesiest and live for a good pun. -Witch better have my candy. Love this skirt and cozy cardigan!! You look like fall perfection! So did you end up dressing up? This post made me giggle haha! I'm definitely more into autumn itself than Halloween, but I had fun dressing up with my fiancé this year, and I only spent like $10 on my costume because I used things I already had! Loving your warm, autumnal outfit! 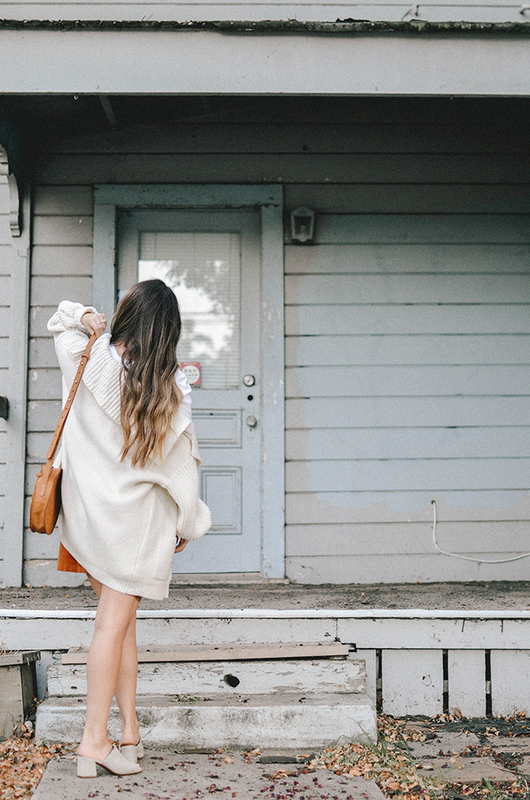 This is a cute and casual outfit for fall! Hope you had a great Halloween! 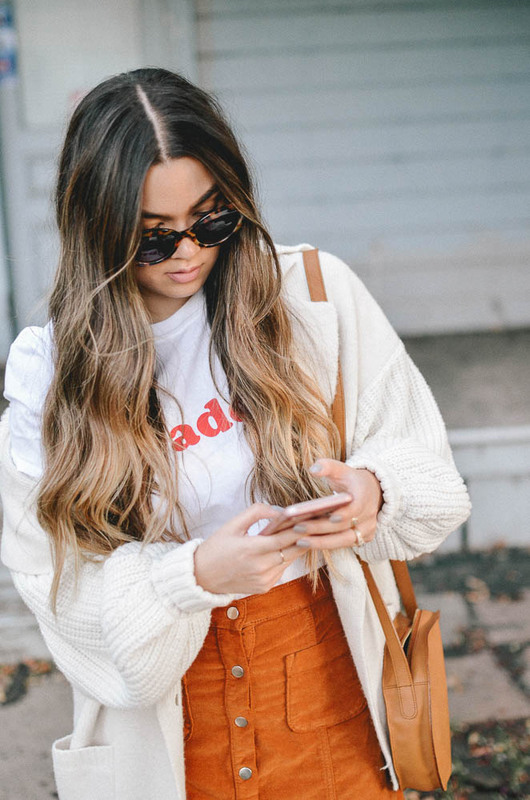 In love with this fall look! 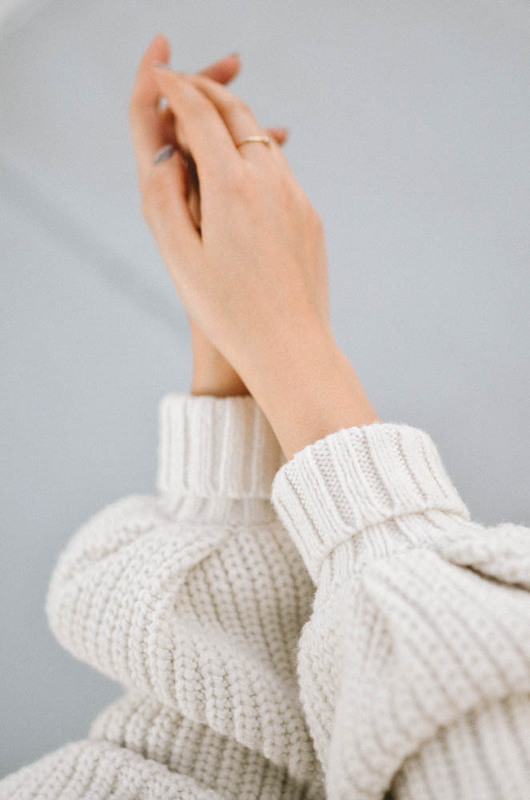 Love that cozy sweater. 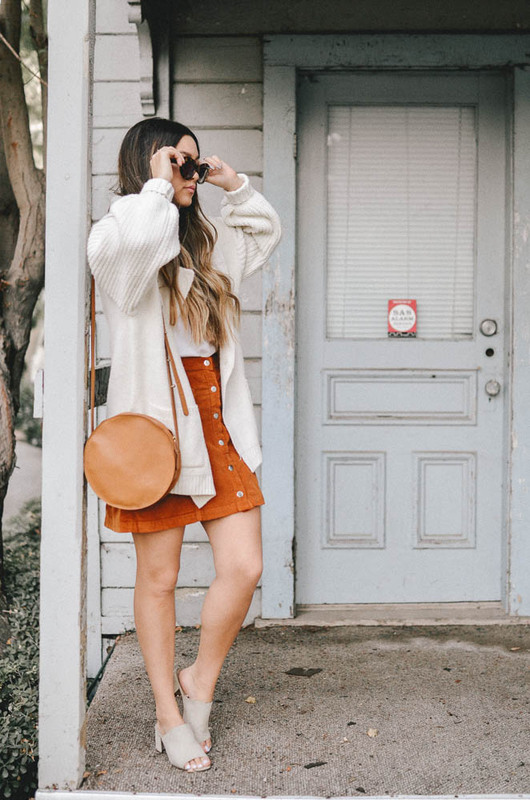 Such an adorable fall look! Slightly obsessed with this look!